This week I want to go over the information you may want to include in your press release before the release of your book. *Taken from a series of articles on the CAN Marketing Blog. While a lot of this may be done by the publicity director at your publishing house, it doesn't hurt to know what is needed for a press kit. To begin, capture the attention of the reviewer with a "headline" about your new release. This could include a wonderful endorsement by a best-selling author, or a review by a major magazine or newspaper. After that, you'll want to include a 2-3 sentence book blurb that engages the reviewer and makes them want to read more. Follow this up with a longer blurb (two or three paragraphs). Include important information about the book -- ISBN #, price of book, contact information for the publisher, as well as your author website and email address. Also include a photo of the book cover. Next write up a short and long bio of yourself. Include pertinent information that emphasises the work you are promoting. For example, if you are promoting a fictional book about pirates and you happen to be a history teacher, that might be good information to include in the bio. But if you are promoting your next romance series, how important is it for readers to know that you spent 15 years in the insurance business? Not very--unless of course, your book has something to do with the insurance business. Also, be sure to list any special awards your books may have received. One great way to research this is to go to amazon.com and browse the many different author biographies there. To go along with the bio, include a professional author photo. Other items to include in your press release are top reviews or quotes, and sometimes authors will add questions and answers, which some media contacts will use as part of their interview. While I enjoy this part of marketing, those hills and mountains can still be intimidating. 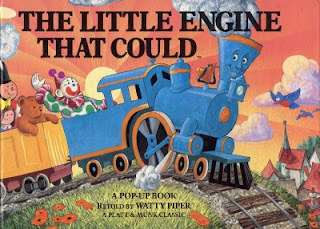 But it's okay, Little Engine, you can do it! Take things one mile at a time. Once you complete the pages for your press release, print a few copies on high quality paper, and with a good printer, and put together some folders to hand out to your local newspapers, radio or tv stations (and even more media possibilities that we'll go over next month). Include a business card, and promotional resources such as bookmarks, posters, postcards or a writing pen. Next Tuesday, we'll learn more about Creating a Media List. Until then, keep chugging up those hills . . .